Whew!!! Another nail-biter! Way too close for comfort for 3+ quarters...especially after that razor-thin win over the Sooners the week before. It took the offense most of the game to finally get rolling for a couple of touchdowns that sealed the deal for a win over Kansas, allowing the Husker faithful to finally breath a little easier. This weekend's contest against the KSU Wildcats has become a winner-take-all game for the Big 12 Northern division. A win here for the Huskers clinches the opportunity to play Texas (probably) in the Big 12 Championship game on December 5th. It also guarantees us a better tier of bowl games to be invited to, so there are lots of chips on the table this Saturday. More good stuff below including a great article by Randy York, an update from Huskerpedia, NUz from the Alumni Association, some holiday travel tips and an interesting list of college football coach salaries (thanks Shari) at the end. Enjoy! P.S. Many thanks to all of you who sent condolences...my family truly appreciates your thoughts and prayers. Nebraska returns to Memorial Stadium for a Saturday night matchup with Kansas State, with the Big 12 North Division title on the line. It will also be Senior Night in Lincoln as 13 Cornhusker seniors will play before the home crowd for the final time. Game time for the contest is 4:45 p.m. PDT, with the contest nationally televised on ESPN. The Huskers enter the game as winners of three straight contests, most recently a 31-17 win at Kansas last Saturday. The victory improved Nebraska to 7-3 overall on the season, and 4-2 in Big 12 Conference action. Kansas State is just a half-game behind Nebraska in the North Division standings at 4-3 in Big 12 play and the Wildcats are 6-4 overall on the year. Saturday night’s game is the regular-season finale for the Wildcats, who not only will be playing for a Big 12 North crown, but also bowl eligibility. The winner of Saturday’s game will pick up its fifth conference victory. Each of the other North Division teams have at least four conference losses, meaning Saturday’s victor will head to the Dr. Pepper Big 12 Championship Game in Arlington, Texas on Dec. 5. Texas can clinch the South Division crown with a win over Kansas on Saturday in Austin. Nebraska has a commanding 76-15-2 all-time edge in the series between the two schools. The Cornhuskers have a 41-8 advantage in Lincoln, including wins in 19 of the past 20 meetings at Memorial Stadium. Nebraska has won four straight overall in the series after K-State won five of seven meetings between 1998 and 2004. Nebraska: Bo Pelini (Ohio State, ‘90) owns a 17-7 record in his second season with the Huskers. Pelini guided Nebraska to nine wins in his first season as head coach, joining Bob Devaney, Tom Osborne and Frank Solich as the only Nebraska coaches to win nine games in their first season leading the Cornhuskers. Prior to taking over as the Huskers’ head coach, Pelini served as defensive coordinator at NU, Oklahoma and LSU. Previously, he had stints as an NFL assistant with San Francisco, New England and Green Bay. Kansas State: Bill Snyder (William Jewell, ‘63) is in the first season of his second stint as Kansas State’s head coach and his 18th year overall as the Wildcats coach. He has a 142-73-1 record with KSU, including a 5-12 mark against Nebraska. Snyder retired following the 2005 season, but returned to KSU for the 2009 season. · The 2009 senior class includes eight players in their fifth year in the program (Brooks, Cammack, Dillard, Harvey, Hickman, O’Hanlon, Suh, Turner) and one player in his sixth year with the Cornhuskers (Christensen). · Four members of the senior class were originally walkon players who have earned scholarships, including Cammack, Koehler, Meyer and O’Hanlon. · The senior class has combined for 176 career starts entering Saturday’s game, led by three-year starters Ndamukong Suh (34), Jacob Hickman (33) and Larry Asante (32). · The 13 seniors come from eight states, including five homegrown Huskers, two players from California and one each from Virginia, Missouri, Oklahoma, Maryland, Oregon and Tennessee. · Nebraska will also honor junior Blake Lawrence who made the decision to give up football earlier this fall after a series of concussions. Lawrence will pick up his degree this December, graduating in just 2 1/2 years. · Senior safety Rickey Thenarse is hopeful of receiving a medical redshirt and returning for the 2010 season, and will not be announced on Senior Night. Thenarse was lost for the season with a knee injury in the first quarter of Nebraska’s Sept. 26 contest against Louisiana-Lafayette. The topsy-turvy 2009 Big 12 North Division race has crystalized. The winner of the Nebraska-Kansas State tilt in Lincoln will head to Arlington, Texas on Dec. 5 for the Dr. Pepper Big 12 Championship Game. The winner of the game will pick up its fifth Big 12 win, and each of the other four North teams has already suffered four or more losses. · A Nebraska win would give the Huskers their fifth appearance in the league title game in the first 14 seasons of the league. Nebraska represented the North in the game in 1996, 1997, 1999 and 2006. The five Big 12 title game appearances would likely be tied with Texas, which will clinch their fifth Big 12 Championship Game appearance with one win in its final two games. Only Oklahoma (7) has played in more Big 12 title games. · In addition to its appearances in the conference title game, Nebraska has also tied for the North Division crown in 2001 and 2008. · Kansas State would make its fourth Big 12 Championship Game appearance with a win, tying Nebraska and Colorado for the most appearances among North Division schools. Nebraska enters Saturday’s game with a three-game winning streak in Big 12 action, having won road games at Baylor and Kansas, sandwiched around a home win over Oklahoma. The three-game conference winning streak marks just the third time since 2001 that Nebraska has won three straight conference games. Last season, Nebraska clearly played its best football in the month of November, winning its final three regular season games against Kansas, Kansas State and Colorado. In 2009, Nebraska again appears to be hitting its stride as fall begins to turn to winter. The Huskers have defeated Oklahoma and Kansas in November to move atop the Big 12 North standings. · Nebraska owns a 5-1 record in games played in November under Head Coach Bo Pelini. Nebraska’s lone November loss under Pelini was at No. 4 Oklahoma on Nov. 1, 2008. · NU is 7-1 under Pelini in games played after Nov. 1, including last year’s Jan. 1 Gator Bowl victory and the 2003 Alamo Bowl win over Michigan State when Pelini was the interim head coach. Nebraska’s five-game November win streak is the program’s longest since winning 19 straight games in November from 1992 to 1998. Nebraska holds a dominant 76-15-2 edge in the all-time series against Kansas State. However, the Wildcats recently had a run of success, winning five of seven meetings between 1998 and 2004. Nebraska has returned to its winning ways against the ‘Cats by posting victories in each of the past four meetings. · A win on Saturday night would be NU’s fifth straight over the Wildcats, marking the Huskers’ longest current win streak against a Big 12 North foe and second-longest against any Big 12 opponent (Baylor). · A fifth straight win would be the sixth time in the series Nebraska has won five or more consecutive games against Kansas State, including nine straight from 1911 to 1924, five straight from 1936 to 1940, 10 straight from 1943 to 1952, eight straight from 1960 to 1967 and 29 straight from 1969 to 1997. The prime time contest on Saturday will be Nebraska’s second straight night home game following its 10-3 win over Oklahoma on Nov. 7. Those two contests are Nebraska’s first home night games in November since a 2002 game against Texas. The NU-Kansas State game this Saturday will mark just the fourth November home night game in school history (also vs. Kansas in 1992). · Nebraska has had outstanding overall success when playing under the lights at Memorial Stadium. Since the first night game in Lincoln in 1986, Nebraska is 29-5 under the lights at home, including 2009 victories over Florida Atlantic, Louisiana-Lafayette and Oklahoma. Nebraska’s five losses in home night games have all come against teams who won at least 10 games in that season (Washington, 1991; Texas, 2002; USC, 2007; Virginia Tech, Missouri, 2008). · The Huskers’ dominance at night in Lincoln has been impressive, as 23 of the 26 home night wins have been decided by 13 points or more. Nebraska's Saturday night game against Kansas State will be televised nationally on ESPN, the network and the Big 12 Conference announced on Sunday morning. Kickoff from Memorial Stadium is set for 4:45 p.m. Pacific. ESPN's Saturday night prime-time crew of Brad Nessler, Todd Blackledge and Erin Andrews will call the action from Lincoln. The winner of Saturday night's game will advance to the Dr. Pepper Big 12 Championship on Dec. 5 in Arlington, Texas, against the South Division champ. Texas can claim the South Division with a victory in one of its final two games against Kansas and Texas A&M. Nebraska's final two regular season games can be seen nationwide, as the Huskers Nov. 27 matchup at Colorado will be carried nationally on ABC with a 12:30 p.m. (PT) kickoff. Lawrence Kan. - Following a win over No. 20 Oklahoma last Saturday in Lincoln, the Huskers came into Kansas' Memorial Stadium and won their third Big 12 Conference road game of the year, 31-17, moving the Huskers to 7-3 overall and 4-2 in conference. The game was highlighted by Niles Paul and Roy Helu Jr., who each made big plays when the Huskers needed them most. Paul caught four passes for a career-high 154 yards and also returned two kickoffs for 72 yards, including a fourth-quarter return into KU territory that set up the Huskers' go-ahead score. For Helu, he carried the ball 28 times for 156 yards and scored three times. But more importantly, 82 of Helu's yards came in the fourth quarter, including touchdowns runs of 20 and 14 yards. The Huskers used a balanced attack, rushing for 214 yards on 42 carries, while Zac Lee completed 13-of-21 passes for 196 yards, giving the Huskers 410 yards of total offense. On the other side of the ball, the Blackshirts held the KU rushing attack in check, as the Jayhawks were held to 99 yards on 29 carries. Quarterback Todd Reising was forced to put the ball in the air 41 times, only completing 19 passes for 236 yards. Lawrence, Kan. - Welcome to Nebraska Football Anatomy 101, where we will dissect a 2009 Husker football season a little differently than everyone else. To join this class, there is one mandatory requirement. Forget about that 9-7, eight-turnover loss to Iowa State and how it affected the way this state, this conference and the national media chose to view Nebraska ... as a bit of a non-factor in a game where the Huskers, last time I checked, still rank among the top five college football programs of all time. When the media would rank the Huskers as low as ninth among the league's 12 teams in weekly assessments, they all seemed to be saying the same thing - Nebraska, you have definitely improved, but you still have a long way to go. And that may well be true, but today's "lecture" isn't looking at every rut in the road and every flaw on the stat sheet. No, today we have chosen to focus on how Nebraska's coaches and players - and all those who support them - reacted to perhaps the strangest game in the history of Memorial Stadium. Fortunately, they Bo-lieve in the Pelinis and the Process, and when the football gods took one away from them inside Memorial Stadium, they replaced that upset to Iowa State with one of their own against Oklahoma. You could see some throwback offense in that OU game, but when it was done more for field position than points, people still found a way to grouse about an offense they thought was on a different planet than the Blackshirts. Well guess what? In a 31-17 win here Saturday night over Kansas, it was Nebraska's offense that saved the day, scoring a pair of touchdowns and converting a two-point conversion after KU took a 17-16 fourth-quarter lead. "We've bailed them out and today they bailed us out," Husker linebacker Phillip Dillard said. If anyone knows the importance of character, it's Dillard, who had to scale a mountain just to get the chance to play as a senior. Now that the offense has seen what creativity and chemistry can do when it's combined with character, watch out. Nebraska just may have the balance needed to excel in all three categories it takes to win - offense, defense and special teams. 1) Bo Pelini's ability to peak Nebraska at the right time. Let's see. Nebraska is 2-0 in November this year and 6-1 in November in Bo Pelini's career as head coach. With Saturday night's nationally televised Nebraska-Kansas State game at Memorial Stadium and the following week's nationally televised regular-season finale at Colorado, both November games, you have to like Nebraska's chances. Oh, almost forgot. Win the K-State game Saturday night, and the Huskers are in Cowboy Stadium Dec. 5 for the Big 12 Championship, most likely against Texas. Maybe it's time to point out that Pelini also has led Nebraska to a December win over Michigan State in a 2003 Alamo Bowl as an interim head coach and a January win over Clemson in the Gator Bowl. 2) Shawn Watson's ability to tap into a Hall of Fame coach's playbook. You should have seen how emotional Nebraska's offensive coordinator was outside KU's Memorial Stadium after the Huskers played their most complete offensive game in a 4-2 conference start. Watson became emotional describing the help he received incorporating a power formation that includes an I-back, a fullback, two tight ends and a wide receiver - a formation that enabled Zac Lee to impersonate three former Husker quarterbacks (Tommie Frazier, Brook Berringer and Scott Frost) on a 37-yard touchdown pass to Niles Paul. Lee sprinted left on an option play, pulled up and pivoted backwards, then found Paul behind two safeties for a 37-yard touchdown pass. Credit Nebraska Athletic Director Tom Osborne for dropping off an old tape for Watson to consider. Watson choked up talking about having a Hall-of-Fame coach one floor up from his office. "He's a beautiful human being. I love the guy," Watson said after several reporters went on to their next interview stop. "Coach Osborne never imposed anything. He just gave me some tape for us to think about. That's the beauty of the man. He lets us figure out on our own how to make it work." 3) Watson's and his staff's decision to simplify the offense and maximize its playmakers. Tom Osborne isn't the only one who has helped Watson modify an offensive game plan that may have been conceptually sound when the season started, but changed dramatically when first-year quarterbacks struggled, an offensive line battled nagging injuries, the top two running backs went down (forcing a new starter to come up from the scout team) and the receiving corps needed to learn the playbook and how to block before they could be difference-makers on the field. "It took humility for Coach Watson to throw out what he planned and concentrate on what we could get done with what we have," said NU Tight End Coach Ron Brown. "We all had to get out of our comfort zone," Watson said. Brown added: "It really was like a scene out of the move 'Apollo 13' when the minds at Mission Control had to come up with more creative techniques to get the space shuttle home. We had to figure out a way to move the ball and win some games. We hope this puts us on a different path to deal with all the trials and tribulations we've had." 4) A team first relationship between quarterbacks Zac Lee and Cody Green. "Zac came in and managed a good game against Kansas," Watson said, "but you know what? When Cody was the starter for two games, Zac was his biggest supporter and did everything he could to help Cody. The same is true of Cody. When we put the ball back in Zac's hands, Cody has done everything he can to support him. They have great respect and admiration for each other. They both want to win, and they'll do whatever it takes to help us win." 5) A willingness by Roy Helu Jr. and Jacob Hickman to put the offense on their shoulders. Forgive the pun, especially when you see a giant ice bag on Helu's right shoulder at Saturday night's press conference while he's trying to describe his 156-yard, three-touchdown performance against KU. It's interesting that the fortunes of NU and KU dipped when Helu and Jake Sharpe battled injuries. Sharpe didn't bounce back, even though he claimed he was 100 percent. Helu has recovered with back-to-back stellar efforts against OU and KU. "I don't know how he does it," center Jacob Hickman said. "You know he's hurting, but he'll still fly over everybody if he has to, to get what we need." Same could be said for Hickman, the up-front leader who had a world-class hip pointer when he tried to chop block OU's Gerald McCoy a week earlier. With a bruise that swelled to the size of a small bowling ball, Hickman could barely get out of bed a week earlier. Yet he battled gallantly again Saturday, setting the tone for what could follow as the Huskers find their niche. 6) The emergence of Niles Paul as one of the Big 12's foremost playmakers. You all saw it on ABC. Paul catches four passes for 154 yards. The effort includes catches of 35, 37, 37 and 45 yards - the sixth highest total in Nebraska history. His first reception set up a touchdown and his third and four receptions set up a pair of field goals. Paul's confidence may have been momentarily shaken in that Iowa State game, but he is back with purpose and passion. Saturday night, he had a career-high 244 all-purpose yards. His spirited kickoff return after KU took the lead is certainly one of the game's most critical plays. No one's comparing Paul to Johnny Rodgers yet, but he's building a resume that could make him a crucial all-purpose component on a championship-contending team. "He's one of the toughest players we have on this football team," NU Receiver Coach Ted Gilmore said Saturday night. :"We all knew he could catch the ball, but we've challenged him to become a physical blocker. He's taken on that challenge, and it makes him more dangerous as a playmaker." 7) Carl Pelini's willingness to refresh the legs of a physically drained defense. No one will understand the physical and emotional investment Nebraska's Blackshirts made to hold Oklahoma to three points in a game the Huskers needed to transform their season. A week later, Nebraska's defensive coordinator didn't have to be prodded to make an observation. "We looked tired today," he said. "Bo and I talked after the game. It's late in the season, and we have to rethink how we need to prepare this team physically for Kansas State. We have to make sure we're fresh." The good thing is the Husker defensive staff isn't facing what stared the offensive staff in the face. There will be no Apollo 13 scene to deliver this solution. A national championship defensive coordinator. who is now a head coach, will meet with his brother and other members of the staff and find a way for the Blackshirts to be the Blackshirts on Saturday Night Live in Lincoln. 8) The magic leg of Alex Henery. It's November, isn't it? Time for the nation's best field goal kicker to warm up his leg to put points on the board and pin teams inside their own 20. Saturday night, Henery connected on all three field goal tries - a 25-yarder in the first quarter, a 33-yarder in the third quarter and a 38-yarder in the fourth quarter. All boomed like a cannon through the uprights and would have been good from much longer distances. Henery is now 15-of-18 on field goals this season and 41-of-47 in his Husker career. He was expected to kick another one after the Jayhawks took their first lead of the game at 17-16. "I thought I'd have another one there at the end, but I was glad we got another touchdown," Henery said, preferring to see a new spark to an offense that finished with 214 yards rushing, 196 yards passing and 410 yards total. 9) A road warrior mentality on this football team. Coaches and players can't look past K-State to a road game in Boulder, another one in Arlington or a third one in a bowl game. But you can. This team has a knack for playing well on the road. The Huskers now have four straight road wins in the Big 12. How many of you last summer saw losses in Columbia and Lawrence? We know. We know. You didn't have back-to-back losses at home figured in either. But football is a crazy game, and it requires a survivalist mindset. Nebraska has that mindset. 10) The greatest fans in college football. Do any interview with any player or any coach, and one thing you know they all count on is you. Win or lose, they know you will support them like no other team gets supported in college football. So get your game face on. Saturday night's crowd needs to mirror the electricity that you plugged in for Oklahoma. Bo said it was the best he'd heard since he's been here. Can you top it for Nebraska against Kansas State for the Big 12 North title? A proven, veteran, Bill Snyder, against Bo, an equally passionate leader in his second year as head coach. Nebraska has committed to an allotment of 12,000 tickets to a Big 12 championship game, if the Huskers qualify. Deadlines are looming for that, and bowl plans come on the heels of the game. Right now, those plans could range from the Holiday to the Cotton to a BCS date. They will rise or fall on the outcomes of the last two regular-season games. Nebraska athletic teams continue to pace the Big 12 Conference in the classroom, leading the Big 12 in the exhausted eligibility graduation rate for the seventh consecutive year with an impressive 94 percent rate. Several Nebraska teams also earned strong scores in the Graduation Success Rate (GSR) Report released Wednesday by the NCAA. Nebraska continues to set the pace in the Big 12 in terms of Exhausted Eligibility graduation rates. The exhausted eligibility rate surveys the graduation rate of scholarship student-athletes in 10 incoming freshman classes who complete their eligibility at the university. Nebraska's exhausted eligibility rate has improved 22 percentage points since the inception of the rate in 1991-92. Nebraska senior defensive tackle Ndamukong Suh has been named one of five finalists for the 2009 Bronko Nagurski Trophy. The award is presented annually to the nation's top defensive player and is sponsored by the Charlotte Touchdown Club and the Football Writers Association of America. Joining Suh among the finalists for the award are Iowa linebacker Pat Angerer, Tennessee safety Eric Berry, Alabama nose tackle Terrence Cody and TCU defensive end Jerry Hughes. The winner of the 2009 Nagurski Trophy will be announced on Dec. 7 at a banquet in Charlotte. Lincoln - A total of 20 former Huskers saw action during Week 10 of the 2009 NFL season, while one player was off with a bye. On the road in Oakland, Mike Brown and Demorrio Williams were key contributors in the Chiefs’ 16-10 win over the Raiders. Brown caused the Raider passing game fits all day, as he intercepted two passes and deflected another two balls. Williams totaled ten tackles on the day, including six solo stops. Former Huskers Sam Koch and Fabian Washington played big roles in the Ravens’ 16-0 shutout of the Cleveland Browns on Monday Night Football. Koch pinned the Browns deep in their own territory all night, as the Seward, Neb., native booted seven balls for a totals 293 yards, with no touchbacks and four punts downed inside the Cleveland 20-yard line. Washington produced two solo stops, including a tackle for loss, helping the Ravens’ defense hold Cleveland to just 160 yards of total offense. Three former Huskers met in St. Louis, as the New Orleans Saints stayed unbeaten with a 28-23 win over the Rams. For the Saints, Scott Shanle produced six solo stops, while Carl Nicks paved the way for the offense to accumulate 420 yards. On the other side of the ball, Josh Brown was 2-2 on extra points and knocked home his lone field goal attempt from 32 yards out. Fan are also encouraged to vote for former Huskers for this years' Pro Bowl. Below is a list of players on the ballot and here is the link to vote. Lincoln Behind a record night from Kayla Banwarth, No. 9 Nebraska collected its 20th win of the season, sweeping No. 24 Baylor, 3-0 (25-16, 25-21, 25-20) Wednesday night. Banwarth keyed a stifling defensive effort by Nebraska (20-6, 13-4 Big 12), collecting 32 digs, establishing school and building records for a three-set match. The performance not only tied her career best, set earlier this season in a five-set win over Minnesota, but was the most by any player in the NU Coliseum since 1987. Banwarth’s effort highlight one of the best defensive efforts of the year, as Nebraska held Baylor to a season-low .089 team hitting percentage. The Huskers had at least 10 digs, as outside hitters Tara Mueller and Hannah Werth added 10 apiece for NU, while Kori Cooper totaled a season-high five blocks, including three solos, as NU totaled nine blocks on the night. While Banwarth’s floor defense carried the night, the Huskers received another strong performance from Lindsey Licht, who totaled a match-high 13 kills on .522 hitting. It was the second straight match Licht hit over .500 and the fourth time in the last five matches the junior right side attacker led the Huskers in kills. Mueller joined Werth in double figures with 13 kills in picking up her seventh double-double of the season. Senior forward Shay Powell has been named to the 2009 ESPN The Magazine Academic All-America Women's Soccer Team, earning Second-Team accolades after a prolific career with the Huskers both on and off and field. A native of Dallas, Texas, Powell is one of only 32 women's college soccer players to receive a spot on Academic All-America team, which is selected by the College Sports Information Directors of America (CoSIDA). To be eligible, a student-athlete must be a varsity starter or key reserve, maintain a cumulative grade point average of 3.30 and be nominated by the school's sports information directors and coaches. For head coach John Walker, Powell led the Huskers in scoring as a sophomore and junior, compiling 12 goals and six assists in 2007 and 2008. She had four goals and five assists as a senior in 2009 and started 17 games, missing only a week of action in mid-September due to injury. Through her career, Powell played in 72 games, earning a start 53 times, while finishing with 17 goals and 11 assists (45 points). Powell is part of Nebraska's long-standing tradition of academic excellence, as the Huskers boast more Academic All-Americans than any school in the country. Entering the 2009-10 school year, Nebraska had a nation-leading 269 CoSIDA Academic All-Americans across all sports. The Huskers are in control of their own destiny for the Big 12 title with a win this weekend over Kansas State at home. It will be our last home game tailgate of the season and we will be serving brats from Jerry's Hometown Meats in Fremont and red beans and rice, jambalaya, and dirty rice from Mudbugz in Valley. Please reply to this email with a head count if you plan on attending so we have enough food and beverage. The NU-OU Heisman tour was a success and they are currently getting the second and final round of balls autographed. Out of 1,000 footballs authorized by the Heisman committee less than 100 are available to the general public for Christmas delivery and only available on HuskerPedia. They will be ready to ship on Dec. 8th in time for Christmas delivery. You can order yours now at this link. A new feature on the HuskerPedia BBS is the Marketplace forum where registered users can post want ads and items for sale. 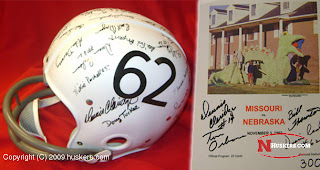 There are currently two unique six Heisman autographed auction items there now at this link. Last year we auctioned off 1962 Missouri game program covers with proceeds going to the NU athletic department. 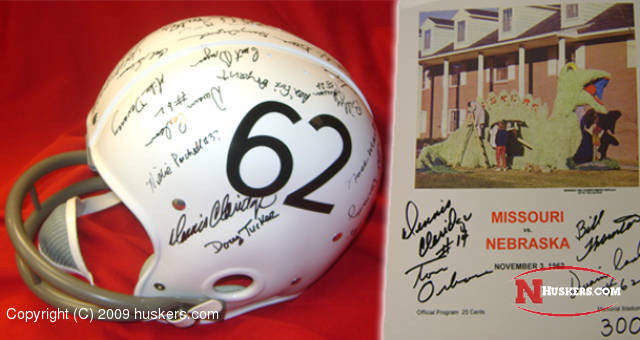 This year they will be auctioned off at Huskers.com with co-operation of Randy York who has secured additional signatures of team captain Dwain Carlson and Tom Osborne in addition to captain Dennis Claridge and Bill "Thunder" Thornton. There are less than 30 copies left signed by Thunder who passed away in December of 2008. Link to auction article is here. The special offer for the Husker Rewards Card through the Nebraska Alumni Association has been extended to Feb. 28, 2010. You can support the alumni association and get great Husker rewards with the card. Details are here. Once we beat Kansas State at home this week we will be traveling to Colorado with the Sidetrack Band for their first ever concert in Boulder. The VA Tech Sidetrack concerts sold out so insure that you will be part of this historic first. Johnny Rodgers will also be with us at the game in Boulder for the Thursday and Friday concerts at the Harvest House in the Millineum Hotel in Boulder. Details are at this link. Don't forget to vote for Suh for Heisman in the ESPN poll. A permanent link for voting is on the front page of HuskerPedia below the schedule in the right hand column. Vote every day. Looking forward to seeing some of you at the K-State tailgate. As always, thanks for your support of HuskerPedia and GO BIG RED! Post-season football is in the air with Nebraska still a possible participant in the Big 12 Championship game as well as nearly every bowl game with a Big 12 tie-in. The Nebraska Alumni Association is your source for up-to-date bowl travel and ticket information. Demand will be extremely high and space limited, so call 888-353-1874 or click here to secure your spot. There's still time to nominate an accomplished Nebraska alum – or family – for one of the Nebraska Alumni Association's 2010 awards: Alumni Achievement Award, Distinguished Service Award, Alumni Family Tree Award, Outstanding International Alumnus Award or the Young Alumni Award. Click here to read the details and submit a nomination – by Dec. 1. In honor of the 20th anniversary of the Lied Center for Performing Arts, the 2009 UNL holiday ornament features the center in brass with a 24-karat gold finish and silk-screened color. It measures approximately 3 inches in diameter and comes in a gift box. This three-dimensional, limited-edition ornament is offered to members of the Nebraska Alumni Association at a special price of $20, including shipping, handling and sales tax; nonmembers pay $25. To order, call (888) 353-1874 or (402) 472-2841 or e-mail the Nebraska Alumni Association. Enjoy a pre-holiday break in Vegas and cheer the Husker basketball team as they play in the Las Vegas Classic tournament, Dec. 22 & 23, 2009. Get ticket information by calling 8008BIGRED and special room rates from the Venetian Hotel. Then join Coach Doc Sadler and other Husker fans at a pre-game event for food and plenty of Husker spirit. Event date and time to be posted as it becomes available. Six Heisman Trophy winners (three from Nebraska; three from Oklahoma) autographed footballs and photos at the Wick Alumni Center the afternoon before the NU/OU contest – just before another successful Football Friday. You have one last chance to enjoy the festive Husker atmosphere and pre-game chalk talk at the last Football Friday on Nov. 20, from 4:30 to 7 p.m.
And then there were six ... The number of reunions planned in conjunction with the 2010 Husker SpiritFest/Alumni Weekend, April 15-17, 2010, is growing. The Class of 1960, UNL Libraries Student Employees, Alumni of Color, Cather Hall 1960s, Love Memorial Hall and Sigma Kappa Sorority will all hold reunions. Gather your college cohorts and jump on the reunion bandwagon by contacting Shelley Zaborowski at the Nebraska Alumni Association. Quick! Check your wallet or purse. Are you carrying a credit card with a picture of Memorial Stadium on it? If you haven't gotten it lately, look closer. Thousands of Husker fans still have the old Chase Husker card. That program expired this spring and it's no longer supporting the alumni association. If you want part of every dollar you spend to come back and support the student and alumni involvement programs run by the Nebraska Alumni Association with great benefits and NO extra cost to you – the Husker Rewards Visa is the card to carry. Go to www.huskerrewards.com to learn more. UNL's aggressive pursuit of American Recovery and Reinvestment Act funding is paying off. UNL faculty were awarded $15.7 million in federal grants funded by federal stimulus legislation through Sept. 30, the end of the first quarter of record-keeping for ARRA awards. Read more. The NCAA Division I Board of Directors has elected UNL Chancellor Harvey Perlman to chair the group beginning at the close of the April 2010 meeting. Perlman also serves as chairman of the Bowl Championship Series Presidential Oversight Committee and as a member of the Big 12 Conference Board of Directors. Congratulations Chancellor. Way to Stand Up For Nebraska! The day before and the Sunday after Thanksgiving are often two of the busiest air travel days of the year. Each year about this time I put together my list of suggestions that hopefully make your travel around the holidays a little easier. Here are the three biggest mistakes people make and my recommendations: Mistake #1 Wrapping your Christmas gifts is a big NO-NO. The TSA agent will most likely have to open them up for security reasons. Also, carrying-on foods like salad dressing, gravy and cranberry sauce will be confiscated so ship them ahead or put them in your checked bag. Cookies, cakes and pies, however, can be carried on (but you should make sure to send me samples in advance so they are tested for quality). Mistake #2 Arriving at the airport at the last minute is a big mistake. Lines will be extra long this time of year as many first-time travelers take extra time to check-in and clear security. We recommend arriving 90 to 120 minutes before departure time if you are traveling during the peak travel days. Mistake #3 Using your nickname on your ticket will cause headaches. The TSA's new Secure Flight program is being phased in and will require that the name on your ID match your reservation exactly, as well as extra information such as date of birth and gender. We recommend that you go to our website www.executivetravel.com 24 hours before your flight to check-in and have a boarding pass issued. Most airlines at that time will request that you provide the additional information such as birthday and gender. Although small differences between your ID and boarding pass shouldn't be problematic right now, consistency will help minimize your time in line. My best advice for traveling during the holiday is smile and take a big dose of patience and things will go just fine. Most airlines (except Southwest Airlines) will charge you as much as $15-$30 to ship each piece of checked-in luggage. You might be surprised to find out that many times it is cheaper to send your bags by UPS versus paying the airlines to check them on the plane. I asked Misha in our office to call UPS and find out what it costs to ship a 30 pound package from Omaha to Dallas and Boston. The 4 business day rate using your own packaging is $17.99 (Dallas) and $27.36 (Boston) to send a 30 pound package by UPS. Combine the cost of checking in your luggage with the hassle factor of carrying all those bags through the airport and having to unwrap your gifts for security and you may agree with me that sending your luggage by UPS may be the best thing you do to make your travels hassle free. Travelers will now be able to get their flu shots on the go following the opening of several flu shot kiosks by Chicago-based medical organization Flu-ease. This year, Flu-ease and a local medical facility have teamed up to open gate-side kiosks in 10 airport sites from New York to San Francisco. This makes a lot of sense for business travelers who are on the go and can't take the time to schedule a shot. Are you ready for some football? – Executive Travel is now taking reservations for the Big 12 Championship game to be held in Dallas on Saturday, December 5. Our 3 day-2 night tour features a charter flight, 2 nights hotel at the official team hotel, game tickets, transfers, Husker huddle tickets and much more. Call our office today 402-435-8888 and find out all the information or visit our web site www.executivetravel.com. Two vintage football helmets and three signed program covers are up for auction this week. Looking for that perfect holiday gift for mom or dad or grandma or grandpa ... or both? Huskers.com is offering something that longtime Husker fans will cherish forever ... vintage 1962 Nebraska football helmets signed by Husker players, coaches and staff who returned to Lincoln this fall to celebrate Nebraska's NCAA record 300th consecutive sellout at Memorial Stadium. The first game in the ongoing record sellout streak was against Missouri on Nov. 3, 1962. On September 26th this season, Nebraska players wore throwback uniforms for the 300th sellout game against Louisiana Lafayette. The NU Athletic Department honored the former players, coaches and staff who were part of that game with a special reunion celebration that weekend. Reunion participants consider these helmets treasured possessions, and now four helmets just like them have been made available to Big Red fans on Huskers.com. Two of the four helmets are being auctioned off this week. Bidding for each helmet begins at $300 with minimum incremental bids of $25. Bidding will end for one helmet at 2:45 p.m. on Tuesday, Nov. 24. Bidding for other helmet will end at 3:00 p.m. on Tuesday, Nov. 24. I hope all the Veterans in our group got a chance to hear a hearty thank you from fellow Americans Wednesday. I would also like to add my heartfelt thanks for your service to our Country. We tend to take freedom for granted in this country and its important to remember to take the time to remember and thank those who are willing to stand between us and those who would take our freedoms away. SWEET VICTORY!! We were in Plattsmouth watching the game with family, but you could almost hear the cheering from Memorial Stadium in Lincoln. Wow...what a great win for the Huskers and especially the Blackshirts...truly awesome performance. See the articles below for the blow by blow, close your eyes and savor the memories of watching a season-making game. Lets hope the team keeps up that level of play for the rest of the year. If they do we may see them playing Texas in the new billion dollar Cowboys stadium on December 5th. Of course there are lots of other items to read below including an article about the new "Football Experience" facility, News from the Homeland, and another pitch to vote "Suh for Heisman". With this Saturday's game against Kansas being broadcast as an ABC Regional game (which means it will only be on ESPN Gameplan on the west coast), we'll once again need to gather at our favorite watch sites to be able to view the game. So put on your red duds and come on out to Final-Final, Jack's, Legends and Knuckles to cheer on the Huskers. Coverage starts at 12:30 Pacific time, so get there early to get a good seat and grab some great pub grub for lunch before kickoff. The game against KSU was picked up for television coverage and will be broadcast on ESPN (see article below). This means that all 12 games this season were broadcast on some sort of TV coverage! Nebraska goes back on the road this Saturday, traveling to Lawrence, for a Big 12 North Division matchup with Kansas. The game is set to kick off shortly after 12:30 p.m. (PST) from KU’s Memorial Stadium, with ABC providing regional television coverage of the contest. Nebraska enters the game with a 6-3 overall record and a 3-2 mark in the Big 12 Conference, following a 10-3 victory over 20th-ranked Oklahoma last Saturday in Lincoln. The win ended a four-game losing streak against the Sooners and marked the Huskers’ second win over a ranked foe this season. Nebraska is right in the thick of the North Division race, standing a half-game behind division leader Kansas State. Kansas stands at 5-4 on the season, including 1-4 in Big 12 Conference play, after a 17-10 loss at Kansas State last Saturday. KU began the season 5-0, but has suffered four consecutive setbacks in Big 12 action. Despite the losses, KU remains a dangerous foe, featuring one of the Big 12’s most explosive offensive attacks. Nebraska holds an 89-23-3 lead in the all-time series between the two schools, including a 46-8-1 advantage in Lawrence. The home team has held its own in recent years, winning the past five meetings in the series dating back to a 24-3 Nebraska win in Lawrence in 2003. Lincoln - Call it redemption. Call it justice. Call it Karma. Whatever you want to call it, Nebraska brought home a sweet victory over an old rival, as the Blackshirt defense hauled in five interceptions and shut down No. 20 Oklahoma in a 10-3 victory at Memorial Stadium on Saturday. In a game that harkened back to the classic battles of the Big Red of the past four decades, Nebraska held the Sooners out of the end zone and mustered enough offense to improve to 6-3 overall and 3-2 in the Big 12. The Huskers dropped the 20th-ranked Sooners to 5-4 and 3-2 in front of 86,115 fans and ABC television audience. In a game dominated by one of the nation's best defensive units, Blackshirt Matt O'Hanlon played the biggest game of his career to help the Huskers erase a two-game home skid while erasing the memory of committing eight turnovers in a loss to Iowa State at Memorial Stadium on Oct. 24. O'Hanlon, a senior from Omaha, Neb., tied a Nebraska record with three interceptions while erupting for a career-high 12 tackles. The last of his interceptions ended the Sooners' last chance at the end zone with 27 seconds left in the game. O'Hanlon's huge game also erased any memories Husker fans had of a last second touchdown scored by Virginia Tech in a road loss against the Hokies in September. "This is one of the biggest wins of my career here and I probably can't play much better," O'Hanlon said after the game. "I was pretty down after the Virginia Tech game, and I just needed a breakout game to get my confidence back. I think that happened tonight." Nebraska Coach Bo Pelini said he was proud of his senior safety. O'Hanlon played big from start to finish, achieving his career-best in tackles with nine in the opening half. O'Hanlon helped the Huskers carry a 7-3 lead into the locker room at halftime, but he was far from alone. Defensive back Prince Amukamara hauled in NU's first inteception of the night, picking off a Landry Jones pass and returning it 22 yards to the OU 1. One play later, junior quarterback Zac Lee hit tight end Ryan Hill on a one-yard scoring pass to give the Huskers a 7-0 lead with 13:36 left in the first half. The Huskers also got big plays in the special teams from senior defensive tackle Ndamukong Suh and junior punter Alex Henery. Suh blocked Tress Way's 45-yard field goal with 6:50 left in the first quarter. It was Way's second unsuccessful attempt of the quarter, following a 46-yard miss on OU's opening possession. The NU defense also held the Sooners on a 4th-and-1 play inside the 20 with a big tackle for loss from Eric Hagg, before Way finally cashed in with a 28-yard field goal for the Sooners with 24 seconds left in the half for OU's only points of the game. But his struggles continued in the third quarter, when he misfired wide left on a 42-yard attempt to end another OU scoring opportunity. Nebraska, which had been pinned deep in its own territory early in the first quarter, flipped the field on the Sooners with Henery's 66-yard punt that buried OU at its own 2. Henery punted six times in the first half for a 43.5-yard average, including two punts inside the OU 20. In the opening half, Nebraska managed 75 yards on 17 carries on the ground, led by Helu's 77 yards on seven carries. Lee and starter Cody Green combined to complete just 3-of-8 passes for five yards. Jones completed 14-of-28 passes for 106 yards, but his interception was converted into a touchdown for the Huskers. OU mustered just 28 yards on 17 carries on the ground. In the third quarter, O'Hanlon made a major impact by pulling down his first interception and returning it 30 yards to set up a Henery field goal that gave NU a 10-3 lead with 5:38 left in quarter. Unfortunately for Henery, exactly one quarter later, he misfired wide right on a 43-yard field goal attempt to end his streak of 25 consecutive field goals made of less than 50 yards. That attempt would have given the Huskers a 10-point lead. In the fourth quarter, O'Hanlon struck again. Just seconds after Jones connected with Dejuan Miller on a 33-yard pass play, O'Hanlon hauled in his second interception of the night to notch NU's third pick of Jones for the game. The interception ended OU's threat and gave the Husker offense possession at the NU 19 with 12:53 left. Oklahoma native Phillip Dillard then got in on the action picking off a Jones pass at the NU 33 and returning it nine yards. Dillard, a senior linebacker from Tulsa, recorded eight tackles, including two tackles for loss and one 13-yard sack of Jones as well. The Sooners got one last shot, with 41 seconds left, but O'Hanlon put his name in the Husker record book alongside of Dana Stephenson, Joe Blahak and Ric Lindquist as the only players in NU history to post three interceptions in a game with his pick at the NU 6 with 27 seconds left. Sophomore Jared Crick, the reigning national defensive player of the week, continued his strong play with eight tackles of his own, including a shared sack, three quarterback hurries and a pass breakup, while Larry Asante added eight tackles of his and one breakup. Senior defensive tackle Ndamukong Suh added four tackles of his own, while adding three hurries, a breakup and a blocked field goal. The Blackshirts held OU to just 325 total yards on 87 plays, while forcing five turnovers. Jones completed 26-of-58 passes for 245 yards, while the Sooners mustered just 80 rushing yards on 29 carries. Junior I-back Roy Helu Jr. carried the Nebraska offense with 20 carries for 138 rushing yards, while adding three receptions for 15 yards. Helu accounted for 153 of NU's 180 total yards, as Lee and Green combined to complete 7-of-14 passes for 39 yards. Alex Henery played a major role with 11 punts and a 43.7-yard average. The Nebraska football team finished its practice week Thursday with a two-hour workout in Memorial Stadium. The Huskers head to Lawrence, Kan., on Friday for Saturday's matchup with the Jayhawks. Head Coach Bo Pelini said the Huskers finished the week on a strong note. "We've still got a couple little things to iron out, but I thought overall we had a good week of practice, a good last couple days," Pelini said. "Now we've just got to finish the mental preparation and get ready to go." Coming off last week's thrilling 10-3 win over Oklahoma, Nebraska is poised not to have a letdown against the Jayhawks this week. The Huskers are mindful that KU is a talented football team. "What happened last week against Oklahoma, we put that behind us right away," Pelini said. "It's about executing against a good Kansas team. We know we're going to get their best shot. We know they're going to be ready to play. They've got their backs against the wall. And they're looking at it like they have a three-game season. So we know the challenge we have sitting in front of us. Our guys will be ready to go." Although NU controls its own destiny to win the North Division, Pelini said the team hasn't talked about that at all. "That takes care of itself," Pelini said. "All we're talking about is Kansas. If you earn it, it'll be there at the end. You can sit there and get so focused on what the goal is at the end, you lose sight of the process and that's what I've preached forever is stay focused on the process, it's going to get us that title." NU and Kansas kick off at 12:30 p.m. (PST). Regional television coverage will be provided by ABC. The Big 12 Conference and ESPN announced on Monday that Nebraska's Nov. 21 home finale against Kansas State will kick off at 4:45 p.m. PST from Memorial Stadium. The game will be televised nationally on either ESPN or ESPN2, with the decision on the channel made on Sunday, Nov. 15. The Nebraska-Kansas State contest could determine the Big 12 North representative in the league title game on Dec. 5 in Arlington, Texas. Entering this week's games Kansas State is atop the division at 4-2 in league play, while Nebraska is a half-game behind at 3-2. Nebraska's appearance on ESPN or ESPN2 will be its second of the season, with the first a nationally televised Thursday night win at Missouri on Oct. 8. It also guarantees all 12 of Nebraska's regular-season games will be televised, including nine on network or cable television and three pay-per-view contests. The prime time contest will be Nebraska's second straight night home game following last Saturday's 10-3 win over Oklahoma that was televised by ABC. The two contests are Nebraska's first home night games in November since a 2002 game against Texas. The Kansas State game will mark just the fourth November home night game in school history (also vs. Kansas in 1992). Nebraska's game this week at Kansas will be televised regionally by ABC with kickoff set for shortly after 12:30 p.m. PST. The Huskers' regular-season finale at Colorado on Friday, Nov. 27 will be nationally televised by ABC, also with a 12:30 p.m. (PST) kickoff. Take it from Johnny Rodgers, Mike Rozier and Eric Crouch. Watching film from four decades ago, three decades ago and nearly one decade ago was a new experience for Nebraska's three Heisman Trophy winners over the weekend. Video images of their signature plays and other meaningfully related Heisman moments have new snap, crackle and pop in the Nebraska Football Experience Room. The room was officially dedicated before Friday night's Nebraska-Oklahoma banquet for major award winners at the Champions Club in Lincoln. Those same Huskers and Sooners, as well their coaches, also were honored at halftime of Saturday night's NU-OU game at Memorial Stadium. "I love the way the room incorporates all the new technology," said Rodgers, who cut the ceremonial red ribbon at the official dedication. "I know our recruits and all our fans will enjoy the new video because Mike, Eric and I loved every minute of it. We enjoyed watching history come alive in a very unique way." Rodgers, Rozier and Crouch viewed the video with Nebraska Athletic Director Tom Osborne, who was involved in either coaching or recruiting all three Husker Heisman winners. They also watched the video a second time with winners of a Huskers.com experientual auction and saw things they hadn't seen during the first viewing. Osborne said the Nebraska Football Experience Room, located just inside the front lobby of the North Stadium Complex, is an important part of Nebraska's newly remodeled recruiting path, designed to showcase Husker tradition. "It was great," Rozier said. "Of course, any time I see my mom in a video, I'm going to be happy." Crouch said watching the new video, which uses creative graphics and surround sound, made him think of all the elements that enabled him to achieve Heisman Trophy status, including the weight and conditioning facility that's adjacent to the new video room. Osborne, Rodgers, Rozier and Crouch said the ultimate benefactors of the new room are NU recruits and Husker fans, who will spend eight minutes in the room and walk out both educated and entertained. New videos, including one that focuses on the Nebraska Game Day Experience, also will be shown in the room, which is open during normal business hours and free of charge to the public. The room is a linchpin of an ongoing remodeling project to showcase Nebraska football tradition in the Osborne Athletic Complex. The new recruiting path also includes a new mural in the strength and conditioning complex, a new hallway display featuring Nebraska's major football award winners, and newly designed walls outside the locker room that showcase the accomplishments of the Huskers' walk-on program and the history of Nebraska's Blackshirts. Senior safety Matt O'Hanlon has earned recognition as Big 12 Defensive Player-of-the-Week, following his outstanding performance in Nebraska's 10-3 victory over No. 20 Oklahoma on Saturday night. A native of Bellevue, Neb., O'Hanlon tied the school record with three interceptions, made 12 tackles and tallied one pass break-up. In the process, he became just the fourth Husker to intercept three passes in a game. His first pick set up Nebraska's field goal that gave the Huskers a 10-3 third quarter lead, while the final interception sealed the victory on Oklahoma's last drive. O'Hanlon has 48 tackles this season and leads the team with four interceptions. His performance against the Sooners also helped the senior receive a "helmet sticker" from ESPN's College Football Final. O'Hanlon's honor marks the third Big 12 Defensive Player of the Week award for Nebraska in the past month, joining Ndamukong Suh (Oct. 12) and Jared Crick (Nov. 2). The award and honors keep coming for senior defensive tackle Ndamukong Suh and his Nebraska defensive teammates. On Wednesday, Suh was named one of eight semifinalists for the 2009 Lott Trophy, named after Hall of Famer Ronnie Lott. The Lott Trophy is in its sixth year and is presented to the nation's top defensive player, while equally considering the athletic performance and the personal character attributes of the player. Other finalists for this year's award include safety Eric Berry (Tennessee) safety Taylor Mays (USC), defensive tackle Gerald McCoy (Oklahoma), linebacker Rolando McClain (Alabama), defensive end Sam Acho (Texas), defensive end Jerry Hughes (TCU) and defensive end Eric Norwood (South Carolina). The finalists for the Lott Trophy will be named on Nov. 24 and the winner will be announced on Dec. 13 at a banquet in Newport Beach, Calif.
* Suh was named one of four finalists for the Rotary Lombardi Award on Tuesday. The 6-4, 300-pound Suh will be in attendance at the Dec. 9 Lombardi Award dinner in Houston where he will look to become Nebraska's fifth winner of the award. * Senior safety Matt O'Hanlon has received conference and national attention for his record-setting performance in NU's win over Oklahoma last Saturday. O'Hanlon's three interceptions helped earn him Bronko Nagurski National Player-of-the-Week honors, along with Big 12 Defensive Player-of-the-Week accolades. * O'Hanlon's recognition as the FWAA/Nagurski Player of the Week marked the third time Nebraska has won the award this season. Suh won the award after his performance at Missouri and fellow defensive tackle Jared Crick received the honor after a record-setting sack performance at Baylor. * Nebraska is the first school in the history of the Nagurski weekly defensive honor (since 2001) to win the award three times in one season. In the nine-year history of the award, there were only three schools that have won the Nagurski award twice in the same season prior to this year. * Nebraska defenders have also twice won the Walter Camp Defensive Player of the Week (Suh vs. MU, Crick vs. Baylor), won the Lott IMPACT player-of-the-week twice (Suh vs. MU, ISU) and captured Big 12 Defensive Player-of-the-Week honors three times (Suh vs. MU, Crick vs. Baylor, O'Hanlon vs. OU). * Nebraska ranks in the top 11 nationally in four major defensive statistical categories, including second in scoring defense and pass efficiency defense, 10th in rush defense and 11th in total defense. * Nebraska held seven straight opponents to 280 or fewer yards, the longest streak by a Blackshirt defense since 1996. Opponents are averaging just 3.97 yards per play which ranks fifth in the country. In five Big 12 games, NU is allowing a Big 12-best 3.7 yards per opponent snap. * Nebraska has allowed 16 points or fewer in eight of nine games this season, and the 93 points allowed is the second-fewest by a Nebraska defense through nine games in the past 25 seasons. The Blackshirts have not allowed a fourth-quarter point in the past three games and have allowed just one second-half offensive touchdown in five Big 12 Conference games. * The Blackshirts have given up only three passing touchdowns this season, tying Air Force for the national lead. Nebraska is the only school in the country allowing a touchdown pass on less than 1 percent of the opposition's passing attempts. Nebraska has held five opponents to 50 percent or less in the passing department and the opponent pass completion percentage of 49.8 percent ranks sixth in the country. * Nebraska has allowed its five Big 12 opponents an average of just 77.4 rushing yards per game, and each of the Huskers last seven opponents has averaged fewer than 3.0 yards per rush. In Big 12 games, Nebraska has allowed only two runs of 20 yards or more. * Nebraska has allowed opponents just 14 trips into the Red Zone this season, a mark that ties for TCU for the fewest in the country. * Suh and Crick are the only defensive tackle combination in the country to currently rank 1-2 on their team in tackles. They are the only two defensive tackles among the top 40 in the Big 12 in tackles per game. * Crick and Suh are the first pair of Blackshirt interior linemen to post double figure TFLs in the same season since 1990, and their combined totals of 27 tackles for loss and 14 sacks are the best for a duo of Blackshirt defensive tackles since All-Americans Jim Skow and Danny Noonan combined for 39 tackles for loss and 26 sacks in 1985. * Nebraska junior cornerback Prince Amukamara is tied for eighth nationally in passes defended at 1.33 per game. Amukamara has nine pass breakups and three intercpetions on the season. In Big 12 games only, Amukamara leads the conference with 1.8 passes defended per game. * In Big 12 games, Crick and senior linebacker Phillip Dillard rank sixth and seventh, respectively in tackles per game. Dillard has three games of eight or more tackles in conference play. Just a reminder but we need to keep voting for Suh everyday. One of our former board members now living in Iowa said that the last he checked Suh is currently the frontrunner with nearly 67,000 votes, but his percentage has dropped from 32% of the total votes to only 22%. C. J. Spiller of Clemson has pulled ahead of Tim Tebow and is closing in on Suh, so its apparent that Clemson fans are very good at getting out the vote. Suh needs our continued support! Here's our chance to vote for SUH for the 2009 Heisman! As the sponsor for the Heisman trophy, Nissan gets to cast one vote and they are voting based on fan input. Make your voice heard!! You will have to type his name in (Ndamukong Suh) and then you will be directed to the results page. Lincoln - A total of 17 former Huskers saw action during Week 9 of the 2009 NFL season, while four players were off with a bye. In the “Battle of the Bays”, Tampa Bay got their first win of the season over Green Bay, 38-28. Sporting their throwback creamsicle jerseys, the Bucs scored 21 points in the fourth quarter, while holding the Packers to seven second-half points. Barrett Ruud totaled four tackles, with the Bucs defense intercepting Packer quarterback Aaron Rodgers three times. For the Packers, Ahman Green surpassed Hall of Famer Jim Taylor as the Packers’ all-time leading rusher with 8,208 yards, as Green carried six times for 45 yards on Sunday. Zackary Bowman continued to play well for the Chicago Bears in his second year in the league. In a loss to Arizona, Bowman had four solo stops and intercepted his second pass of the year. Bowman returned a Matt Leinart pass 39 yards, which resulted in a Bears’ touchdown three plays later. At the Superdome, Carl Nicks and Scott Shanle contributed to the Saints’ 30-20 win over Carolina. Now 8-0, the Saints are off to their best start in the franchise’s 43-year history. Shanle had four total tackles and a pass deflection, as the Saints defense forced three fumbles, including one which was returned for their seventh defensive touchdown of the year. For the offense, Nicks protected Drew Brees as he threw for 330 yards and one touchdown, the fifth time this season Brees has thrown for over 300 yards. Big games bring out the best in Roy Helu Jr. In Nebraska's last five games against teams that were nationally ranked at the time the Huskers played them, Helu has rushed 92 times for 599 yards - an average of 6.5 yards per carry. Nebraska's junior I-back rushed 20 times for 138 yards Saturday night against 20th ranked Oklahoma, marking his sixth career 100-yard rushing game and his third this season. The 138-yard effort against Oklahoma followed a 157-yard rushing performance at OU last year. Helu cited his faith as the source of his strength, enabling him battle through injury and persevere through some tough mental roadblocks in recent weeks. If the key to winning is to stop the run on defense and run the ball on offense, Helu provided the spark on offense. His 63-yard run in the second quarter was a career-long rush, bettering his 57-yard scamper at Oklahoma last season. Helu cited the blocking of Tyler Legate, a sophomore fullback from Neligh, Nebraska, as a big key to his performance. "He was awesome," Helu said of Legate. So was Helu, who now has gained those 599 yards against Texas Tech and Oklahoma last season and Virginia Tech, Missouri and OU this season. Four Nebraska football players have been honored as ESPN the Magazine Academic All-District 7 selections. The teams were announced Thursday and the Nebraska honorees are led by sophomore defensive back Austin Cassidy who earned first-team all-district honors. With his selection to the Academic All-District first team, Cassidy advances to the national ballot for ESPN the Magazine/CoSIDA Academic All-America. Cassidy was joined on team by three second-team Academic All-District 7 honorees, including senior receiver Wes Cammack, sophomore offensive tackle Marcel Jones and junior linebacker Blake Lawrence. A graduate of Lincoln Southwest High School, Cassidy carries a 3.84 cumulative grade-point average in psychology. He has been named to the Big 12 Commissioner's Honor Roll each of his first four semesters on the Nebraska campus. On the field, Cassidy is one of the leaders of Nebraska's special teams units and is a key reserve at safety. Cassidy has played in all eight games and has six total tackles, while adding a pass breakup. Cammack is a native of DeWitt, Neb., and carries a 3.89 grade-point average in agricultural engineering. Cammack has been an academic All-Big 12 pick each of the past two years and is on track to graduate in May. He has played in six games this season as a reserve receiver and a member of the Husker special teams. Cammack has made one reception and has a tackle on special teams. Jones has started all eight games at right tackle and helped a Nebraska offense that ranks among the nation's leaders in sacks allowed. A Phoenix, Ariz., native, Jones carries a 3.35 cumulative grade-point average in construction management. He was a first-team academic All-Big 12 pick in 2008 and is a four-time Big 12 honor roll selection. Lawrence played in three games with two starts this season before being forced to end his football career for medical reasons. Lawrence contributed 10 tackles early in the season before moving into a volunteer student assistant role for the Huskers. Off the field, Lawrence is a marketing major with a 3.91 cumulative grade-point average and is scheduled to earn his degree this December in just 2 ½ years on the Nebraska campus. Lawrence is a four-time Big 12 honor roll selection and a 2008 first-team academic All-Big 12 pick. Nebraska ranks as the national leader in Academic All-Americans in football and across all sports. Nebraska's nation-leading football academic All-America total stands at 98, while Nebraska has produced 269 Academic All-Americans across all sports. Football Academic All-Americans will be announced later this month. Joba Chamberlain went 1-0 with a 3.00 ERA in three World Series appearances. Former Nebraska pitcher Joba Chamberlain played an integral part in helping the New York Yankees to their 27th World Series title Wednesday night. Chamberlain, an All-American during his two-year career at Nebraska, made three World Series appearances, going 1-0 with a 3.00 ERA in three appearances. He earned the victory in Game 4 and came back with a shutout inning of relief in the decisive game six. He recorded four strikeouts in three innings of work in the World Series and held opponents to a .182 batting average. Chamberlain made 10 relief appearances during the postseason, going 1-0 with a 2.84 ERA. He is the first Husker baseball player to earn a World Series ring since Darin Erstad in 2002 with the Anaheim Angels. The postseason capped a solid third season in the Major Leagues for Chamberlain, who went 9-6 with a 4.75 ERA in 32 appearances, including 31 starts in 2009. It is the second postseason appearance in three seasons for Chamberlain, who helped the Yankees reach the playoffs in 2007. Chamberlain compiled a 16-7 record for Nebraska during the 2005 and 2006 campaigns. He went 10-2 with a 2.81 ERA in 2005, helping Nebraska to a school-record 57 wins and a College World Series appearance. Chamberlain was a first-round draft pick by the Yankees in 2006 and reached the Major Leagues in his first professional season. Chamberlain was one of two Huskers to make the postseason, as Brian Duensing compiled a 5-2 mark to help the Minnesota Twins to the American League Central Division title. Duensing was also a member of the Huskers’ 2005 CWS team, going 8-0 with a 3.00 ERA that season. He was 17-2 as a Husker in 45 appearances over three seasons. Friday, Nov. 13 • NU Coliseum • 7 p.m. Following a sweep of eighth-ranked Iowa State, the Nebraska volleyball team hosts Texas A&M Friday night at the NU Coliseum. First serve is slated for 7 p.m. and the match will be carried on selected Husker Sports Network stations, including B107.3 FM in Lincoln and Twister 93.3 FM in Omaha, and on Huskers.com with John Baylor and Diane Mendenhall on the call. The match will also available on HuskersNside. The Nebraska-Texas A&M match is on Friday because of the state high school volleyball championships at the NU Coliseum on Saturday. The Huskers (18-6, 11-4 Big 12) jumped from 10th to ninth in Monday’s poll and are coming off their best performance of the season, a three-set sweep at Iowa State on Saturday. The Huskers quelled the Cyclones and their record crowd of 10,203 with a solid all-around effort, hitting .327 against the league’s top defense. NU became the first team in 34 matches to hit over .300 against the Cyclones, as five attackers recorded at least eight kills. Middle blockers Brooke Delano and Kori Cooper combined for 17 kills and five blocks, as Delano hit .571 with eight kills. NU is now a game out of second place in the league race. Texas A&M (14-9, 7-8 Big 12) looks to snap a three-match losing streak, as it lost to Iowa State on Wednesday. The Aggies dropped a pair of five-set heartbreakers last week, including a home setback to No. 20 Baylor when they lost 18-16 in the fifth. The Aggies rely on their trio of outside hitters, including Sarah Ammerman (4.30 kills per set) and Jennifer Banse (3.26 kps), who rank second and ninth, respectively, in the Big 12 in kills per set. Lincoln – The No. 10 Nebraska volleyball team put together its best offensive performance of the season, sweeping Missouri, 3-0 (25-19, 26-16, 25-16) Wednesday evening at the NU Coliseum. Nebraska hit a season-best .451 on the night, as three Huskers finished in double figures in kills while all five primary attackers hit over .400. Sydney Anderson dished out 43 assists and added two of the Huskers eight aces as the Huskers .451 hitting percentage was the best since hitting .467 against UAB in last year’s NCAA Tournament. Hannah Werth’s 12 kills on .429 hitting led Nebraska (17-6, 10-4 Big 12) while Tara Mueller and Brooke Delano added 11 and 10 kills, respectively. Delano had 10 kills on 12 swings, as her .833 hitting percentage was the sixth-best performance in school history and the sophomore added four blocks. Mueller hit .400 and added seven digs, while Kayla Banwarth totaled a match-high 15 digs and keyed a strong passing effort. In addition to a strong offensive output, Nebraska also matched its season best with eight service aces, including three by freshman Gina Mancuso and two apiece from Werth and Anderson, and tied its season low with two errors. Following a record-breaking freshman season, forward Morgan Marlborough has been recognized as one of the best women's college soccer players in the country, earning a spot on the TopDrawerSoccer.com All-Rookie First Team. Marlborough is just over a week removed from being named Big 12 Offensive Player and Rookie of the Year after she led the conference in scoring with 21 goals and added seven assists (49 points). The Lee's Summit, Mo., native ended the year fourth on the NU single-season goal chart and fifth in points. Against Oklahoma on Oct. 11, Marlborough broke the freshman school record for single-season goals (17 in 1996 by both Lindsay Eddleman and Isabelle Morneau), as she turned in her second hat trick of the year and became one of seven players in school history to produce multiple three-goal games in a career. In 2010, Marlborough will enter her sophomore season just five goals away from reaching Nebraska's all-time top 10 list for career goals. She ended the 2009 regular season tied for third in the NCAA in goals (21) and ranked fourth in points (49). Marlborough's 2009 goal and point totals were the highest of any player on the All-Rookie First Team. Freshmen are not eligible for Top Drawer's Team of the Season. Stanford forwards Kelley O'Hara (23 goals, 9 assists) and Christen Press (16 goals, 13 assists) were named TopDrawerSoccer.com Co-Players of the Season after leading the Cardinal to a perfect 20-0 campaign. Penn State midfielder Christine Nairn (7 goals, 9 assists) was awarded with Rookie of the Season. Nebraska finished 2009 with an 11-5-4 overall record, including a fourth-place regular-season finish in the Big 12 with a 5-3-2 conference mark. The Nebraska soccer team made a mark among the conference schools on the 2009 Academic All-Big 12 Team, as the Huskers had 14 student-athletes named to the squad, announced Tuesday by the league office. Nebraska's total ties Oklahoma State for the most of any team. Senior Shay Powell led the impressive group of Huskers as one of 11 Big 12 soccer student-athletes who achieved a perfect 4.0 grade-point average. In the process, she earned her third consecutive first-team award, an achievement matched by classmates Anna Caniglia, Brittney Lanier and Carly Peetz. All six seniors were named to the first team, as Julie Berkshire and Lauren Isenhower also gained top accolades, in addition to former Husker Shannon Dickerson, whose athletic career was cut short due to an injury. Junior Anna White and sophomore Katie Goetzmann each obtained first-team honors for the second consecutive year, while sophomore Alexa Cardona and juniors Jessica Mills and Jaclyn White earned the first awards of their career. Junior Michaella Fulmer and sophomore Blair Slapper were named to the second team, bringing Nebraska's total to 14, the second-most selections the Huskers have ever had on the Academic All-Big 12 Team (15 in 2008). Nominated by each institution's director of student-athlete support services and the media relations offices, the Academic All-Big 12 squad required first-team members to have maintained a 3.20 or better GPA, and the second team to have a 3.00 to 3.19 GPA either cumulative or the two previous semesters. She must have also participated in 60 percent of her team's scheduled contests. Freshmen and transfers are not eligible in their first year of academic residence. Senior student-athletes who have participated for a minimum of two years and meet all the criteria except percent of participation are also eligible. The Huskers are currently preparing for the first round of the 2009 Big 12 Championship, as No. 4 Nebraska faces No. 5 Oklahoma State on Wednesday at 11:30 a.m. The postseason conference tournament takes place at Blossom Soccer Stadium in San Antonio, Texas. San Antonio - The Nebraska soccer team gave up two first-half goals and could not overcome the deficit against a tough Oklahoma State squad, as the Huskers dropped the first round of the 2009 Big 12 Championship on Wednesday in San Antonio, 3-0. Nebraska outshot Oklahoma State, 14-10, including five from senior Shay Powell. Shots on goal were even at five apiece. Talented twin sisters Tatum and Taylor Edwards each signed a National Letter of Intent to play softball at Nebraska beginning in 2010-11, Head Coach Rhonda Revelle announced on Wednesday, Nov. 11. The twins are battery mates, as Taylor is a catcher and Tatum is a pitcher and outfielder. The sisters are among the best recruits to ever sign with the Huskers, as each has been a three-time all-state selection entering their senior seasons in 2010 at Vista Murrieta High School in Murrieta, Calif.
"We are extremely excited about what the Edwards twins bring to our program," Revelle said. "They are competitive, spirited and they have winning in their blood. Tatum and Taylor will be outstanding additions to the Nebraska softball program. Playing in a talent-rich Southern California area that annually produces hundreds of Division I softball players, the twins have still managed to separate themselves from their talented peers. Tatum was selected as the California Freshman of the Year in 2007 by CalHiSports.com, while the site named Taylor the California Junior of the Year in 2009. A two-time Under Armour All-American, Taylor was also honored as the EA Sports National Junior of the Year last spring while being named a first-team EA Sports All-American.